Bentley Motors unveiled their latest offering at the Los Angeles International Auto Show, called the Bentley Arnage Drophead Coupe. This vehicle, which is destined for production in 2006, is one which I believe has managed to retain ‘traditional’ Bentley lines, and yet look modern at the same time. However, Bentley Motors, a Volkswagen marque these days, is being coy about production, claiming much will depend upon customer reaction. Bentley’s have been sporting chariots for gentlemen for more than 80 years, and the new coupe shares the current Arnage platform, and the suspension from the Arnage R. The engine is also taken straight from the Arnage and is a 6.75 litre twin-turbocharged V8 producing 450 bhp (336 Kw) and 875 Nm (645 lb ft) torque, which is enough to tow the Amari Watergate hotel through the Pratunam markets. The interiors of Bentleys have always featured trees and dead animals, and the new drophead is no different, with several planks of burr oak veneers with a boxwood inlay along the dash and doors, while several herds of cows donated their hides for the upholstery, while a wooden steering wheel with inlayed chrome rim is unique to the car. Whatever, and forget the rhetoric, the Bentley as seen last year at the Bangkok International Motor Show was a stunning vehicle, retailing at around 21 million baht, from memory. The new drophead will be even more so. Hopefully, it may even come to this year’s Motor Show (March 25 - April 3, 2005). In a publicity move that has left the other hybrid engine manufacturers behind, Toyota took the new category land speed record at Bonneville Salt Flats in the US with its hybrid Toyota Prius. The event was kept under wraps until it was released by Car and Driver magazine who had secured an exclusive from Toyota. Running on a 4.8 km course during the land speed trials at the Bonneville Salt Flats in Utah last August, the Prius reached 210 kph to set the mark for the world’s first hybrid-engined vehicle land speed record. 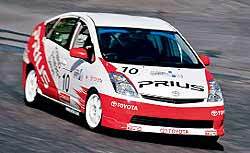 The race-prepared Prius was driven by Car and Driver editor Aaron Robinson, Prius executive chief engineer Shigeyuki Hori and Fumiaki Kobayashi, the group vice-president of technical and regulatory affairs of Toyota North America. The car ran a standard Hybrid Synergy Drive power-train of an electric motor and the 1.5 litre, four-cylinder petrol engine but the final drive gear ratio was raised from the standard 4.23:1 to 3.2:1. The car’s inverter voltage was increased from 500 volts to 550 volts and the petrol engine’s electronic management system was altered to allow it to rev higher. To avoid aerodynamic problems, it was dropped by 12.7 cm so that the body sat only 2.5 cm above the ground. It had specially made Goodyear Landspeed Record tyres, 26 inch diameter at the front and 25 inch at the rear. Extensive bodywork modifications were made to fit the large wheels and tyres, for the event. The interior was also stripped, so owners of road Prius vehicles should not feel short-changed if their one does not quite hit these speeds on the Thailand superhighways! In a wonderful show of generosity, Michael Schumacher is reported as having donated 10 million dollars towards the tsunami appeal. It was also reported by some media that one of his entourage perished while holidaying in Phuket. Whilst there will no doubt be the detractors who will say, “he can afford it,” there are many other sportsmen who can also afford large sums, and golfers and soccer players immediately spring to mind. Michael Schumacher has done the motorsport fraternity a great favour, as well as the victims. Well done Schumi! 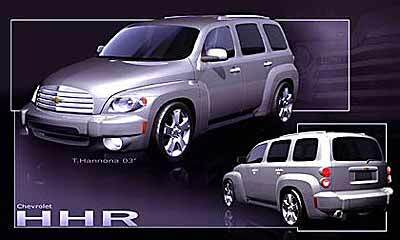 Another “new” vehicle released at the Los Angeles show was the Chevrolet HHR, designed by Bryan Nesbitt, the 35 year old stylist responsible for the Chrysler PT Cruiser. According to GM, stimulus for the design of the HHR come from the 1949 Chevrolet Suburban, built 21 years before stylist Nesbitt was born! The new HHR gets its name from Heritage High Roof and will have a 2.2 litre engine with 104 kW of power, while the fancier 2.4 litre model will have 126kW. Transmission is a five-speed manual and there will be a four-speed automatic option. The reason GM have brought out this model has been the success of the Chrysler PT Cruiser, so GM have done a ‘me too’ exercise with this vehicle. I don’t know about you, but this leaves me fairly underwhelmed to say the least. Next they’ll bring back the ‘woodies’! Remember them? The Porsche Infineon Asia Cup is another of the ‘level playing field’ competitions, and this one is part of the world Porsche Cup competitions. The category is divided into two very hotly contested sections, with Class A being the professionals and Class B being for amateur drivers. The inaugural championship title in 2002 was won by Hong Kong’s Charles Kwan, one of the biggest names in Asian motorsport, and in 2004 the battle for the title went right down to the wire with Kwan, Thailand’s Nattavud and UK’s Matthew Marsh all in a position to take the Asian title. At the final round in Macau in November, it was A-Ha Racing’s Matthew Marsh who finally took the top position for the series. Class B, specially designed for amateur drivers and introduced at the start of last season, has proved fantastically successful, creating a ‘field-within-a-field’ where the competition is just as intense as amongst the professional drivers. Notable amongst these was Thailand’s fastest pizza delivery man, the Pizza Company’s Bill Heinecke. Here is the proposed calendar, to add to your pencilled in dates for the F1 series. And for those who can’t locate the 2005 F1 calendar, here it is again. Pencils sharpened and away you go! Last week, I asked how and when did the terminology “the pits” come into common usage in motor racing? The answer was the French Grand Prix of 1908 when a divided trench with a counter just above ground level was provided for team crews. The trench idea was never used again, but the term “the pits” stuck. And so to this week. While the subject of pits and pit signalling is in my head, who “invented” pit signals and why?